Welcome to Michigan Academy of Dance & Music! Michigan Academy of Dance & Music has a class for everyone. From your child’s first class to their graduation performance, they will find a welcoming and nurturing environment in which to learn and grow. We specialize in beginners of all ages and offer training in dance and music at all levels through pre-professional. Our classes are taught by skilled teachers in positive classrooms. Our costumes and choreography are always aged appropriately. But, The Academy, offers more than great dance and music training! Our students go beyond technique and poise to develop important life skills including; learning to be respectful, confident, and conscientious young people who share their gifts and talents with their community. For more information on our studio, or to find the perfect classes for your child, please Contact Us. NOW OPEN TO AGES 3 - 9!!! Register for Summer Camps and Classes! Is Dance Right for My Child? Why is Music Education Beneficial? Dancing is for all children! Your children can develop all their dance dreams through a creative, education outlet where they can learn social interaction, strength, exercise, team involvement and competition in a healthy way. Whether your child is the next musical prodigy or just learning for fun, they are bound to benefit from some form of music education. 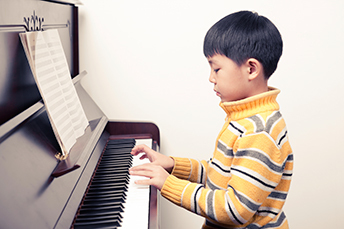 Research shows that learning to read and play music can help children excel in ways beyond the basic ABCs. place to dance no matter what you are looking for. I can't imagine my kids dancing anywhere else!"